I did a home chemical peel and now I have dark brown spots on my face, what can I do? I'm feeling hopeless and depressed about these dark spots. Which works best on wrinkles/fine lines, chemical peels or dermabrasion? I have rashes on my face after a chemical peel, though my pimples disappeared. How long until the rashes go away completely? 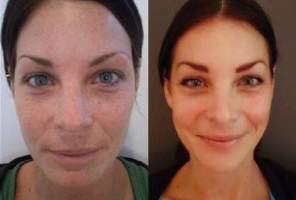 How often can a person get a Vitalize peel? Should you use a face brush and then chemical peel on someone with rosacea? I applied a light chemical peel on my client two days ago and her face is puffy. Is this due to sweating? She is a fitness instructor. Could the white spots on my face after my 3rd chemical peel session be caused by sun exposure? The first two chemical peels I had went well; I didn't have a problem. The third one was a medium peel, and instead of using sunscreen I wore Fair & Lovely cream. Now, I have white spots on my face. Could this be due to the cream, sun exposure, or both? What adverse effects are associated with chemical peels and when can I begin to use soap after the treatments? Is it safe for toddlers to come in contact with chemical peels? Do chemical peels help with acne blemishes? If so, how long would it take for the blemishes to go away? How many peels would I need? Can you use a glycolic acid chemical face peel on rosacea? I had a chemical peel & the esthetician recommended shaving the facial hair with a planer blade, will the hair grow back stiff/thick like a man's? Can I use a 50% or 70% glycolic acid chemical peel at home? I am a 29 year old from India who has a normal complexion. I get pimples on my face and due to squeezing the pimples, dark spots have remained. Can I use a 50% or 70% glycolic acid chemical peel at home? Three years ago I had a dermatologist do this peel on my face...just wondering if it's safe to do myself. My skin is tough and thick after applying a chemical peel, what should I do? I started peeling around my mouth and a little on my chin the second night after applying a chemical peel. I used the second towelette all over (even the peeled areas) and now I'm afraid I have burned the skin! Everything has peeled off now, but my skin is tough and thick. What should I do? Can I resume weight lifting immediately after a chemical peel? I've used 14% glycolic acid every day for 10 years. Now, I want to do an 18% TCA peel. Every article I've read seems to say use Retin-A and AHA for two weeks. Is this correct? Also, I lift weights and would like to know if I can resume my weight lifting immediately following the peel. At age 16, are glycolic peels safe to use my own? A dermatologist recommended that I use a glycolic acid peel 20%. Is it safe for me to apply on my own? I am 16 years old. Are chemical peels the proper treatment for rhinophyma? I've done about 20 chemical peels (every 3 days) on my nose to treat my rhinophyma/very large pores. The solution contains 70 percent glycolic acid. At first the peels didn't hurt, but now they really sting as the dead skin is gone. My nose is back to the shape/size it was in 2000. What's your take on this?